REB has a full line of automatic, inline piston filling and depositing systems. Our inline piston fillers range from a single cylinder to a ten cylinder system. Filling speeds range from 10 - 120 containers per minute. REB's IVS series of fillers and depositors can fill a very large range of products from thin solvents to thick gels and pastes to large particulated products such as potato salad and pie fillings. Fill sizes (on a single machine cycle) range from fractional ounces to 5 liters. 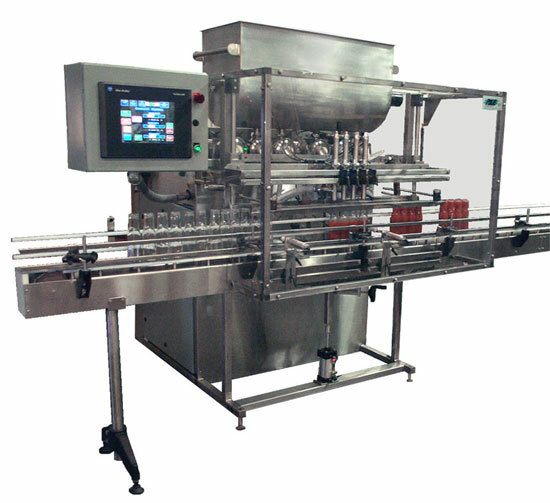 All of our automated inline filling systems are supplied with positive closing nozzles and powered conveyors. The machine frames are all stainless steel and the product contact systems are stainless steel and food grade plastics. We have designed our product contact system using sanitary quick clamp fittings to allow operators easy disassembly. Our automatic inline systems can have one of two types of piston drives, depending on the application: pneumatic piston drives, and hydraulic piston drives. We have developed four different types of container indexing systems for our filling systems. Depending on your needs, up to three types can be used on one machine. This makes the machine very flexible for filling a variety of containers. As a standard, REB supplies the gating finger method of indexing, which is the most versatile for filling a wide range of container shapes and sizes. We can also supply an indexing star-wheel, which is used mostly for round containers and can give you faster indexing speeds. The third method of container indexing is the servo motor-driven timing screw (spiral). This is used mainly when oval containers are being filled. This eliminates container shingling and positions the bottles under the nozzles consistently. The last type of container indexing we use is a multiple lane indexing conveyor system. The type of container indexing used is dependent upon the application and container. Our automatic inline systems are controlled by a programmable logic controller (PLC.) We use Allen Bradley as our standard, but we have used, and are willing to use, other brands per customer specifications. All of our machines have a gross volume adjustment and a fine tune adjustment. The hydraulic drive unit is capable of having its gross volume changed from the operator interface control panel. On the pneumatic drive units, the gross volume is adjusted manually, by a handwheel at the rear of the machine. The IVS filling and depositing systems can be built to be expanded at a later date for increased production demands.